Is It Time to Load Up on Zoe's Kitchen? After a relentless drop in its share price, Zoe's Kitchen investors are wondering when the slide will let up. Zoe's Kitchen (NYSE:ZOES) stock has been sliding for almost a month now, down about 30% since the most recent quarter's disappointing earnings report. When will the pain let up? Is it time to buy? The fast-casual Mediterranean food chain reported results for its last quarter on Aug. 22. The day of the release, shares shed about 18% of their value. The fall continued, with shares dipping below $24 for the first time since the stock market dip in early 2016. What gives? Zoe's is still a small restaurant brand, toting 191 locations across 20 states. During the last 12-month period, 35 new openings and a 4% increase in same-location sales led to a 21.7% increase in revenue. Profit went from $120,000 a year ago to $1.2 million this last quarter. The company also sees another 10 or 11 locations opening by year's end. Hardly numbers that warrant the stock tanking. The panic attack was spurred by Zoe's downgraded guidance. Total revenue is now anticipated to be between $277 million and $280 million, down from the previously stated $277 million to $281 million. Comparable-restaurant sales growth is seen being 4% to 5%, down from the previously stated 4.5% to 6%. A few Wall Street analysts also downgraded their expectations for the stock, effectively sealing the deal for the ensuing drop in prices. It may be surprising to see shares fall so much with a solid report, but Zoe's stock was flying high in the first place because of the company's strong finish to 2015. Revenue grew 32% over 2014 to reach $227 million, and the company saw full-year profitability for the first time since going public back in the spring of 2014. Same-store restaurant sales also jumped by 6.3% during the year. The first quarter of 2016 saw Zoe's pick up where it had left off. Revenue was up 27.6% year over year, as profits doubled and same-restaurant sales were up 8.1%. Management upped its guidance at that point to the numbers that were just downgraded. As a result, the stock reversed course and erased the big jump early in the year. Does the drop mean the end? Despite the relentless slide in price, that doesn't mean the curtain is closing for Zoe's. Even though growth was downgraded, it's important to remember that the updated numbers still represent a 23% increase in sales over last year and the 200th Zoe's location will be opened by the end of the year. The company plans to keep expanding in three ways: increasing the number of restaurants, growing the new catering business, and keeping new traffic coming in with innovation. The expansion of locations looks doable as Zoe's is currently only in 20 states, and the 22% increase in locations over 2015's final count is on track more than halfway through the year. The catering business was launched during the first half of 2015, and the company reported that growth from the segment continues to exceed expectations. Part of the same-restaurant sales growth can be attributed to the new catering delivery system. On the innovation front, Zoe's has an evolving menu of sorts. To keep customers coming back, and to lure new ones in, new items are added, and underperforming ones are reassessed from time to time. Last winter, four new menu options were made available to diners. To complement the new adult entrees, a refreshed kids' menu is also being launched this fall. 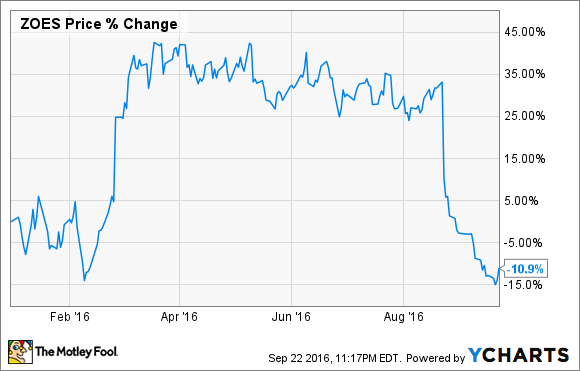 Far from signaling trouble at Zoe's Kitchen, the recent decline in share price represents a tempering of investor expectations. Future prospects for the Mediterranean restaurants continue to look solid. It's hard to say where the bottom will be; more pressure on shares could be in store. However, it is important to look at the long term rather than get hung up by a month's worth of performance, however bad that may be. I believe the steep decline even though growth potential remains intact presents investors with an opportunity. Zoe's is growing locations at an aggressive rate. This hasn't prevented the company from turning its first profit earlier this year. In addition, free cash flow, or cash remaining after operations and expansion efforts are paid for, continues to inch its way toward positive territory. 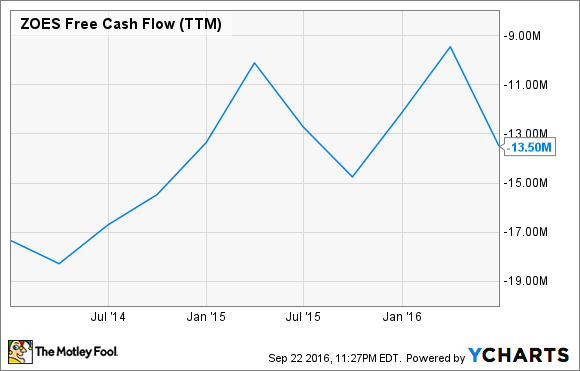 ZOES Free Cash Flow (TTM) data by YCharts. Based on this outlook of growing profitability and cash freeing up, investors have been given an opportunity here. I think now is the time to load up on Zoe's Kitchen stock.